Panomera® W8 Topline Model W8 Topline 75/360 Motor Lens The patented Panomera® Multifocal Sensor System is a totally novel camera technology particularly developed for the extensive video surveillance of large-scale areas. With Panomera®, enormous distances and areas are displayed in a completely new resolution quality - in real time and at high frame rates. The Panomera® 360° Multifocal Sensor System has been developed with special focus on the surveillance of large spaces from a single location. The innovative lens and sensor concept of the Panomera® in combination with a high-resolution fisheye lens allows for the unique recording of a complete half-space (half sphere) without blind spots, thus 360° horizontally and 90° vertically. In places where previously several HD or megapixel cameras would have been required for the surveillance of production sites, logistic centers or public halls, now a single Panomera® 360° Multifocal Sensor System is sufficient. The sophisticated image processing algorithms of the Panomera® 360° Multifocal Sensor System enable a geometrically correct and almost distortion-free display of the surveillance area (linearly scaled in horizontal and vertical direction). This allows the operator a complete and continuous object tracking on the monitor and a unique overall view for evaluating the finest details even at large distances. Panomera® goes far beyond the conventional Full HD 1080p standard and megapixel resolution. 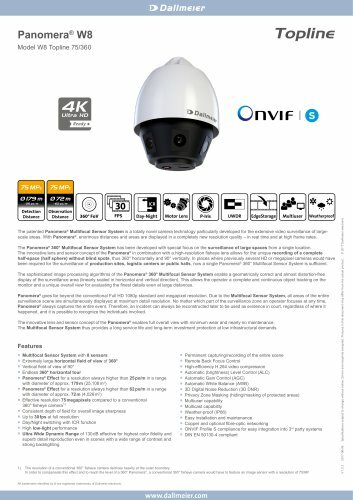 Due to the Multifocal Sensor System, all areas of the entire surveillance scene are simultaneously displayed at maximum detail resolution. No matter which part of the surveillance zone an operator focuses at any time, Panomera® always captures the entire event. Therefore, an incident can always be reconstructed later to be used as evidence in court, regardless of where it happened, and it is possible to recognize the individuals involved. The innovative lens and sensor concept of the Panomera® enables full overall view with minimum wear and nearly no maintenance. The Multifocal Sensor System thus provides a long service life and long-term investment protection at low infrastructural demands. Features ■ Multifocal Sensor System with 8 sensors ■ Extremely large horizontal field of view of 360° ■ Vertical field of view of 90° ■ Endless 360° horizontal tour ■ Panomera® Effect for a resolution always higher than 25 px/m in a range with diameter of approx. 179 m (25,108 m2) ■ Panomera® Effect for a resolution always higher than 62 px/m in a range with diameter of approx. 72 m (4,026 m2) ■ Effective resolution 75 megapixels compared to a conventional 360° fisheye camera1 ■ Consistent depth of field for overall image sharpness ■ Up to 30 fps at full resolution ■ Day/Night switching with ICR function ■ High low-light performance ■ Ultra Wide Dynamic Range of 130 dB effective for highest color fidelity and superb detail reproduction even in scenes with a wide range of contrast and strong backlighting ■ Permanent capturing/recording of the entire scene ■ Remote Back Focus Control ■ High-efficiency H.264 video compression ■ Automatic (brightness) Level Control (ALC) ■ Automatic Gain Control (AGC) ■ Automatic White Balance (AWB) ■ 3D Digital Noise Reduction (3D DNR) ■ Privacy Zone Masking (hiding/masking of protected areas) ■ Multiuser capability ■ Multicast capability ■ Weather-proof (IP66) ■ Easy installation and maintenance ■ Copper and optional fibre-optic networking ■ ONVIF Profile S compliance for easy integration into 3rd party systems ■ DIN EN 50130-4 compliant 1) The resolution of a conventional 360° fisheye camera declines heavily at the outer boundary. In order to compensate this effect and to reach the level of a 360° Panomera®, a conventional 360° fisheye camera would have to feature an image sensor with a resolution of 75 MP. V1.0.3 2017-06-06 Specifications subject to change without notice. Errors and misprints excepted. Pictures in this document may differ from the actual product. © 2017 Dallmeier electronic All trademarks identified by ® are registered trademarks of Dallmeier electronic. Panomera® W8 Model W8 Topline 75/360 Field of View and Resolution 300 Identify (≥250 px/m) 200 Recognize (≥125 px/m) 100 Observe (≥62 px/m) Detect (≥25 px/m) 0 Requirements for ideal resolution distribution Installation height All trademarks identified by ® are registered trademarks of Dallmeier electronic. Specifications subject to change without notice. Errors and misprints excepted. Pictures in this document may differ from the actual product.